all stories start like this and..
On a cold March morning in 2013, a leading real estate based application provider deployed their latest offering to the market, a mobile app that will estimate and analyze calculations for lenders. After few missed deadlines of delivery, this product was one of the most anticipated offering by this company. By the evening of that very same day, most of the clients had called and threated to quit. Loss of thousands of dollars. Reason - a bug in the software that placed the decimal wrongly by one position. The need for a dedicated testing team, a team that would go to all possible extends to find even a single bug, a team who has no connection with the developers, a team who will think just like the user of the app; the need for such a team was staring right on the face and thus was born - CodeRig. 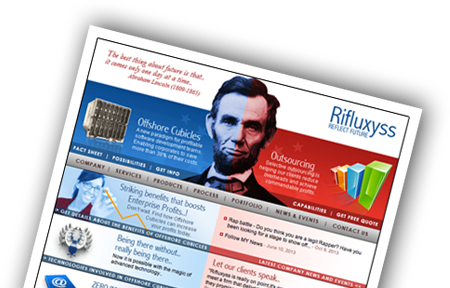 Founded in April 2000, Rifluxyss has been developing custom software applications for clients worldwide. With the overall experience of developing more than 150 iOS apps currently on Apple Store as well as over 75 Android apps on Google Play store, Rifluxyss is a leader in mobile application development.